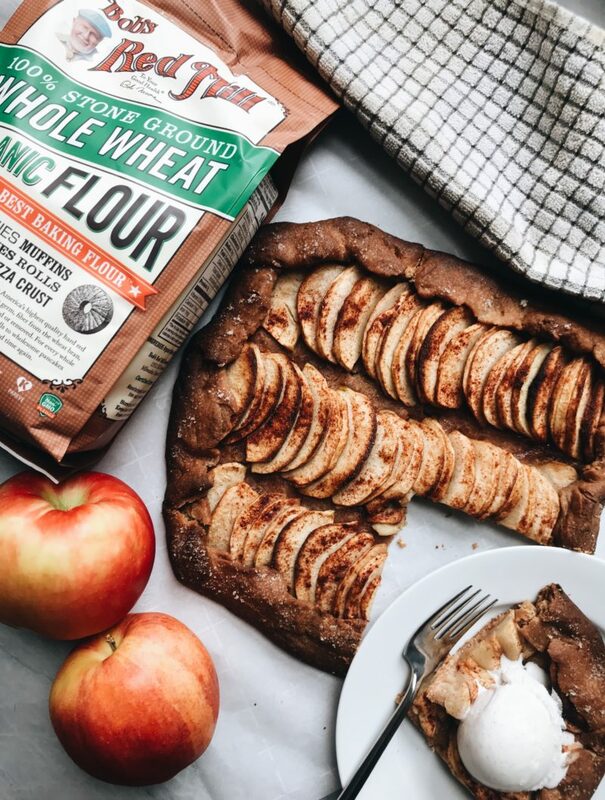 Celebrate Fall with this delicious apple galette. 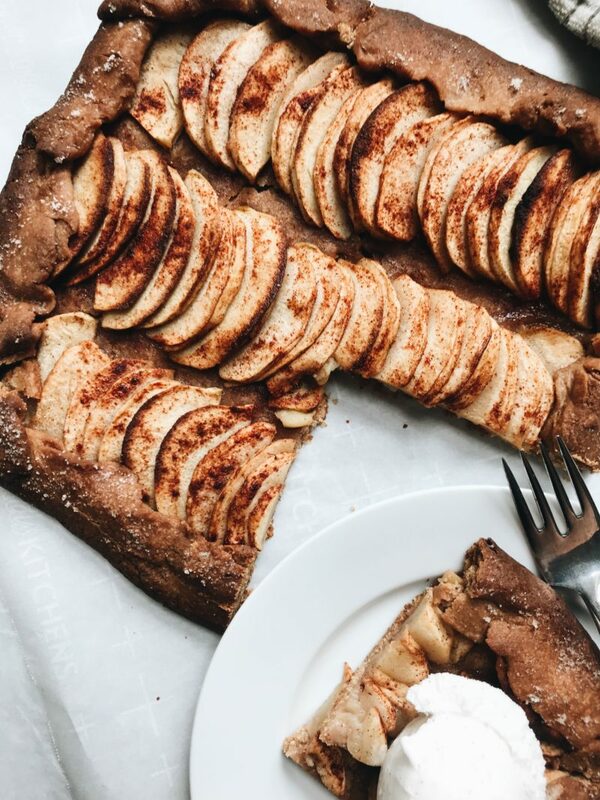 Fall is in full force so I am celebrating with this delicious apple galette. 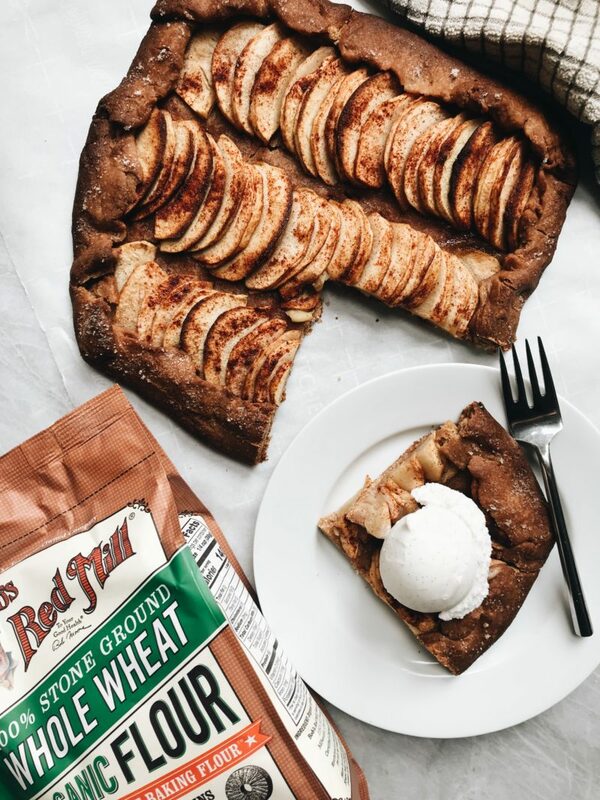 There are so many delicious produce items in season during fall time, and apples is one of my favorites. 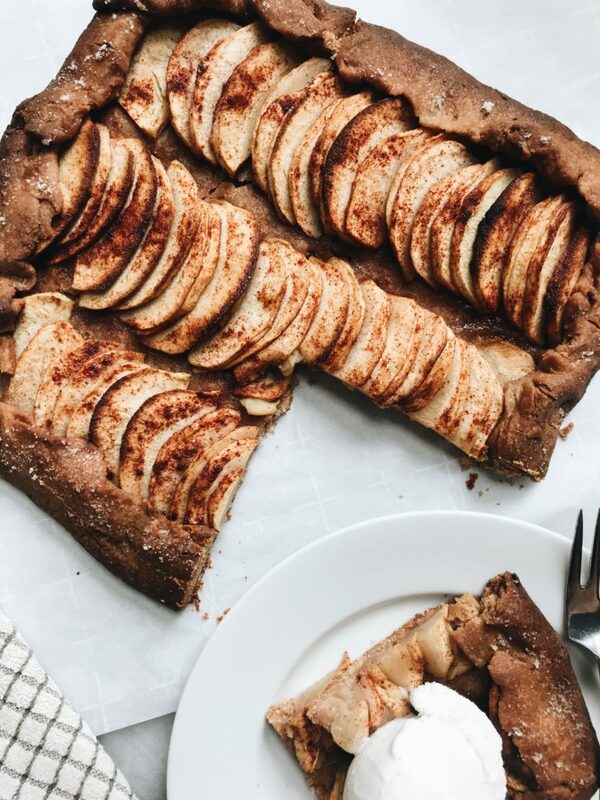 Whether dipping them in some sunflower butter, to baking them into a galette like this, apples are seriously so delicious and are very versatile in recipes. I also am a sucker for a flaky pie crust – so I knew I wanted to combine two of my favorites into a delicious recipe. To achieve this flaky pie like crust, I used the Bob’s Red Mill Organic Whole Wheat Flour. The whole wheat flour makes the pie crust a little more hearty and delicious. I truly love Bob’s Red Mill. Whether it’s their flours, nutritional yeast or oats, they’re my go to for so many products. They’re easily accessible and I buy their products at my grocery store, Whole Foods, or other speciality stores. 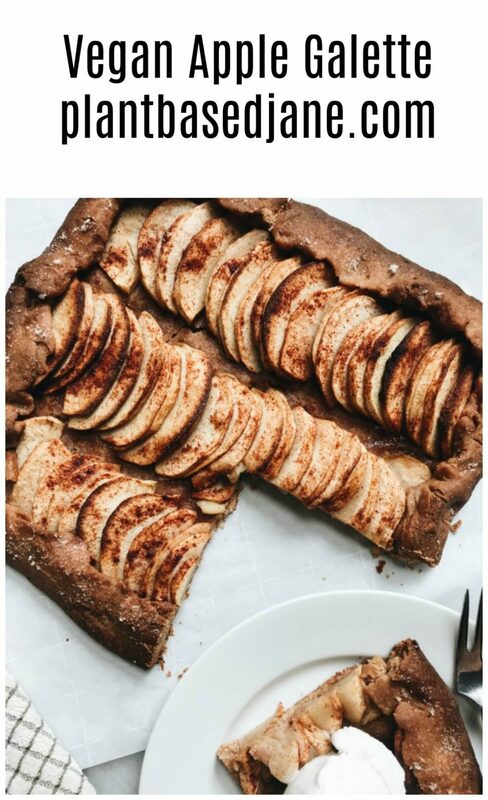 I love serving this galette with a scoop of vegan vanilla ice cream on top. The warmness of the galette melts the ice cream ever so slightly, and just makes it an extremely delectable experience. This is the perfect fall recipe to serve at gatherings, make for your friends/family, or even serve at Thanksgiving coming up in the next few months (idk how Thanksgiving is actually kind of close!). I hope that you enjoy this recipe! Remember to tag me on social media if you make it! Begin by making your crust. Add your flour, sugar and salt to a bowl and mix to combine. Add in your cubed butter and work with you hands to combine the butter and dry ingredients. Mix until the butter has formed into pea sized balls and slowly add in your cold water. Form ingredients until you have a dough. Once your dough is formed, wrap in saran and place in the fridge for one hour. Peel, core and slice your apples into 1/4 inch pieces crosswise. Add to a bowl and add your sugar, cinnamon, and non dairy milk. Mix to combine. Pre-heat your oven to 400 degrees Fahrenheit. Remove your dough from the fridge and lightly flour your surface and rolling pin. Roll out dough into a 12-inch circle and add apples to the dough within 1 inch of the edge. You can be creative with how you place your apples. Once your apples are placed, carefully fold the dough up and over the apples to create a 1 inch border. Pinch any cracks in the dough. Add a sprinkling of sugar to the crust and add cubed butter throughout the apples. 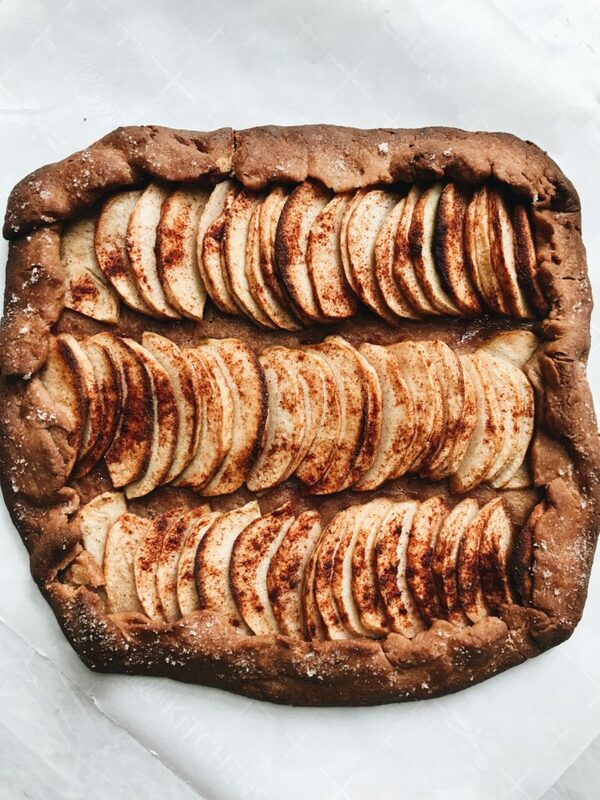 Bake for one hour or until the apples are soft and the crust is golden brown. Let cool and serve! Thanks to Bobs Red Mill for sponsoring this posts. It means a lot to me to work with brands I love and support my blog.